Can’t make this stuff up folks. It’s a weird feeling…being in print. The first blog I ever wrote was in January of 2011, so we haven’t even been around a year. In the grand scheme of the internet machine, we’re just a little guy. Yet, we’ve already had our stories linked many times by websites much larger than our humble little sports culture blog, such as Yahoo! Sports, Sports Illustrated, ESPN, NBC Sports, The Big Lead, Deadspin, Barstool Sports, SB Nation, etc. (insert humble brag comment here) As for print, as far a we know, this is a first. Figures…we’re not famous for some great sports piece, but for ripping on the worst family in America. Maybe this isn’t a new thing? It’s not like we’re reading these trash magazines, so we could be getting quoted weekly for all I know. We have a Mr. Steinhoff, a faithful lobster, and his beautiful wife Stephanie, who happened to stumble upon the Lobshots.com reference in the grocery store check out aisle in St. Louis, to thank for knowing about this at all. Yup…we’re in San Diego, found in St. Louis. Again, figures. I guess I just have to go point-by-point on how many things are messed up about this. – “The World Turns on Kim” – Although it’s flattering to be the sole representative of “the world,” I don’t think that I alone, (1 person out of nearly 7 billion people) am a fair sample of the world demographic. – “Death Threats from fans” – I know I should most offended by the “death threat” comment… which is a complete lie, but I’m more offended that they’re referring to me a “fan”. I’m the furthest thing from a fan that one could possibly be. 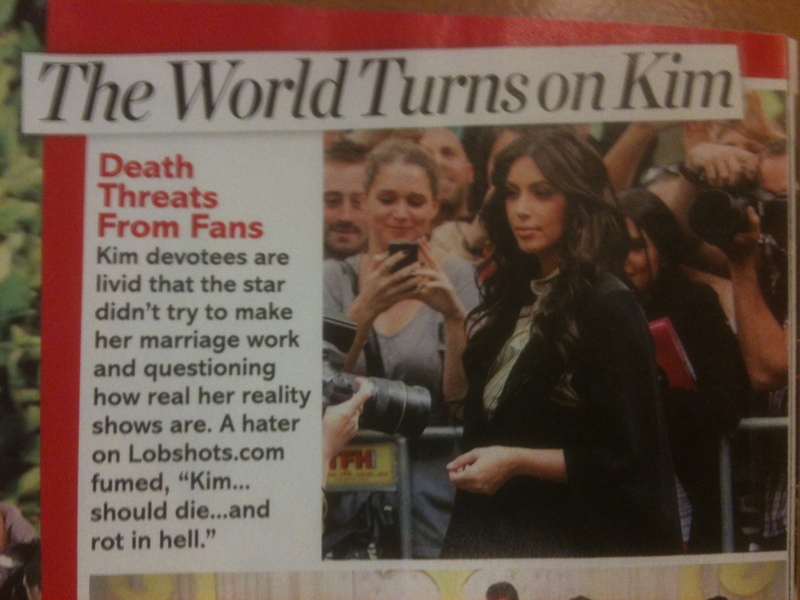 I am an anti-fan, an enemy, an afficionadon’t of the entire Kardashian empire! 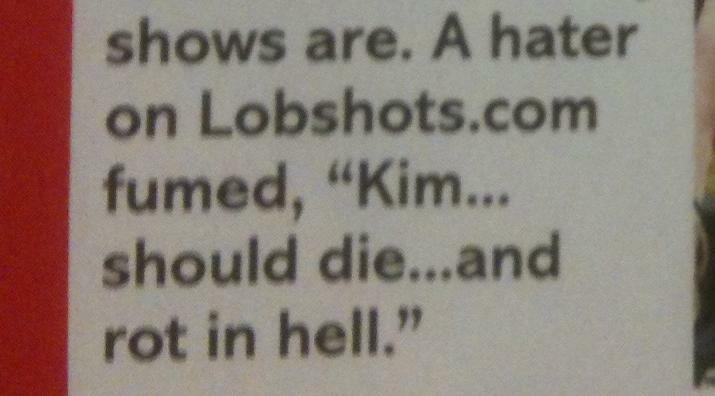 – “A hater on Lobshots.com fumed ‘Kim…should die…and rot in hell.‘” – This is where it gets good. DOT DOT DOT… ah, yes, the infamous “ELLISPIS: a series of marks that usually indicate an intentional omission of a word, sentence or whole section from the original text being quoted.” Whenever you’re quoting someone, just throw in a couple of periods and you can turn that quote into something entirely different. Let’s look at what was actually said. Link to the original post here: I Hate Kim Kardashian. “Kim Kardashian should die of gonorrhea and rot in hell.” This is the sentence that ended up, ‘Kim…should die…and rot in hell.‘ Honestly, “gonorrhea” is easily the best word in the sentence, so I’m angry it was omitted. In addition, they completely changed and ruined the quote of a quote. 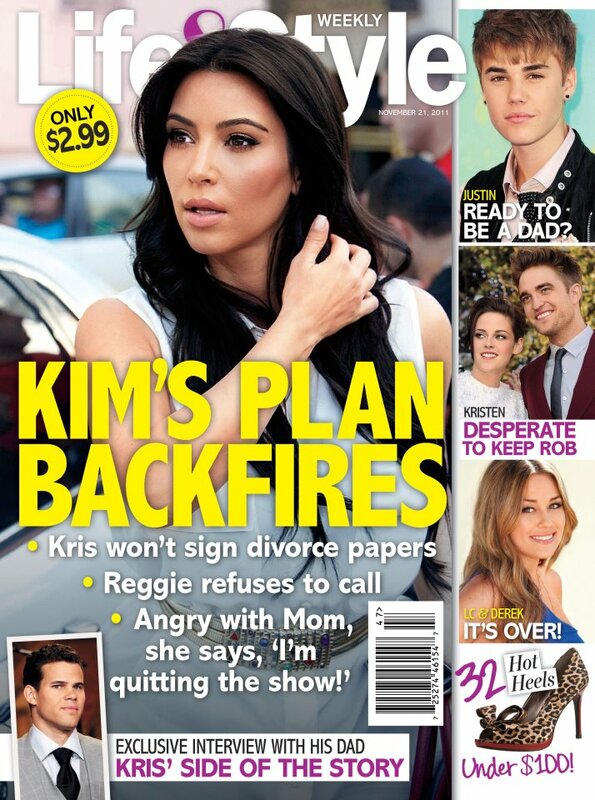 Yes, idiotic-editing-manipulators at Life & Style Weekly, that was a quote. From none other than the American movie classic: Ace Ventura. 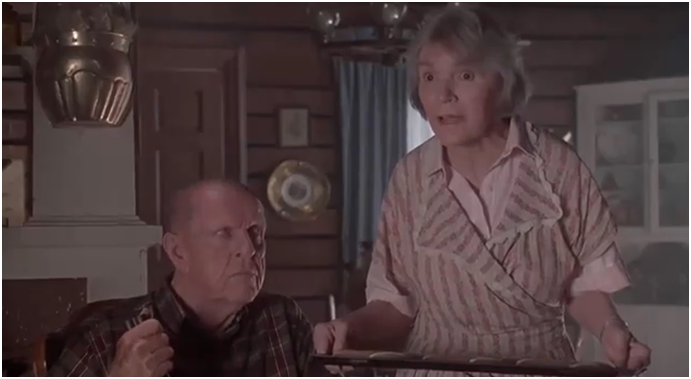 You know, when Ace goes to visit Ray Finkle’s house and he meets his parents? Don’t believe me? It’s word for word, replacing the name Dan Marino with Kim Kardashian. Head to the 2:05 mark on this clip, and watch for 20 seconds. Or, if you’re awesome, just watch the whole clip of Ace visiting Ray Finkle’s house, because it’s, you know, awesome. So, mystery solved. I was quoting a freaking movie because that’s funny… and I’m funny. In addition, the quoting of the quote was not even real… rather something I might have used if I was mean…which I’m not, as I’ve had to point out to you people multiple times. I’m nice, dammit! All things considered, here’s what I’ve learned from our new found fame…I could really get used to this whole “making death threats” thing. Know this, lobsters, you leave a negative comment on a LobShots post… you do so at your own peril. In closing, thanks for publicity Life & Style Weekly magazine, I hope you die of gonorrhea and rot in hell. This entry was posted in Celebrities, Entertainment, Events and tagged Ace Ventura, death threats to kim kardashian, I Hate Kim Kardashian, Kim Kardashian, Life & Style Weekly, LobShots, lobshots famous, lobshots kim kardasian, ray finkle. Bookmark the permalink.